STOCKHOLM (Reuters) – Spotify is a household name, with more paying users than any other music-streaming service in the world. But it doesn't make a penny. Those 30 million paid subscribers help it rake in almost half the revenues in the global industry. But most of the money goes to record labels and artists, while the privately owned Swedish company faces growing competition from Apple with its deep pockets and massive iPhone user base. To reduce its dependence on labels and stand apart from rivals, Spotify is broadening beyond its music library. It is making its own videos, such as interviews with artists, and producing other content like pop-ups that explain lyrics. This drive is being led by a senior executive poached from YouTube. The company is also looking to capitalize on its mobile app's dominant subscriber base – and expand it – by investing in algorithms that "learn" users' tastes and by offering personalized services such as concert recommendations and artist memorabilia. How the 10-year-old company fares with this drive in coming years could determine whether it can stay independent, and perhaps go public, or go the way of many other European tech startups and be swallowed up by bigger Silicon Valley fish. 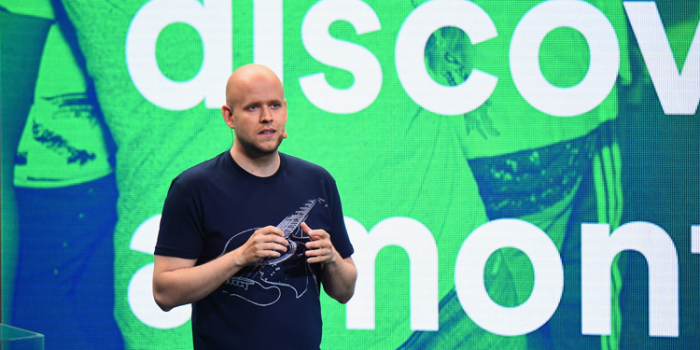 Its success or otherwise will be a test of whether Spotify's "freemium" business model is viable – most of the firm's 75 million users listen for free with commercial breaks. It could also point to a wider reality of whether music streaming can survive as a standalone business, or must simply be one of the services offered by a big diversified tech company like Apple, Google or Amazon. "Can streaming be a big enough business on its own, to stand on its two feet forever? I think the answer would have to be yes if you look at Netflix and what they are doing with TV," Jonathan Forster, a Spotify vice president and one of its first employees, told Reuters at the company's Stockholm headquarters in a meeting room called Rolling Stones. "Even our 75 million is nothing compared to the number of people with smartphones and who like music." Mark Mulligan, managing director of media and technology analysis company MIdiA Research, said Spotify could become profitable – though that might be a long way off if the company continues to prioritize growth, which he believes it will. He said any new products and content would have to prove popular, allowing the company to weather the onslaught from Apple and attract even more subscribers. Spotify does not have the luxury of being able to rack up losses in music and recoup them from phone and tablet sales. Mulligan said it was crucial for the firm to cut better deals with the music industry, which he said may not happen until it had the stronger leverage of closer to 50 million paying users. "Investors have got to take the long view – absolutely." Spotify was born in Sweden in 2006, and was one of the biggest early drivers of music streaming, popularizing the idea of people listening to tracks they did not buy or own. It offered digital music fans and the record industry an alternative to peer-to-peer file-sharing services like Napster which ran into legal trouble over copyright infringement. The company, founded by Daniel Ek and Martin Lorentzon, is now present in 59 markets, and a funding round last year valued it at over $8 billion. It employs 2,000 people, with about half of them working in Stockholm in a building dotted with crates of vinyl records from the likes of John Farnham and Midnight Oil. It makes more than $2 billion a year from subscription fees and advertising, a big slice of the $4.5 billion made in music streaming last year, an industry which MIdiA Research sees growing to $8.5 billion in 2020. But it pays more than 80 percent of that income to record labels and artists. Last year it made an operating loss of 184.5 million euros ($205.5 million), widening from 165.1 million in 2014. Competition is fiercer than ever, from the likes of Pandora and rapper Jay Z's Tidal. After launching last year, Apple Music already has 13 million paid subscribers. "If things continue as they are, Apple should be No. 1 by the end of next year if not the start of the year after," said MIdiA's Mulligan. Google is also competing on two fronts with Google Music and YouTube, the go-to site for free music videos. In 2014, Spotify nabbed YouTube's consumer experience head Shiva Rajaraman, now a product head in Stockholm who spends half his time making sure users are getting offered the right music on their home screens and the rest on new content. "One of the things we are trying to do is simplify Spotify so that it actually does more of the work for you instead of you coming to do all the work," the 41-year-old, who moved to Sweden from Silicon Valley, said in a meeting room called Elton John. Recent purchases of companies like music data firm The Echo Nest have helped Spotify use algorithms to identify users' tastes and build them personalized playlists, an area where rivals have also been active. "(Users) give us a signal and then machines take that input and effectively use machine-learning models to find out what your tastes are and try to get you to have an affinity for it," said Rajaraman, who has three test phones and a folder on his iPhone with every streaming service in the business. Spotify will also start rolling out music-related videos to users, including exclusive performances, interviews, back-stage footage and short music documentaries. The company has also partnered with tickets website Songkick to offer its subscribers personalized concert recommendations based on their location and taste. It is also similarly looking to offer a merchandising service whereby users can buy T-shirts and other paraphernalia from their favorite artists from external partners. Whether new content drives user growth remains to be seen. Spotify, whose investors include North zone, DOST Global and Accel, does not disclose details about its ownership but the co-founders no longer own a majority, having sold off stakes. One investor that says it is in for the long run is U.S.-based investment firm TPG which backed the music streamer this year through its credit and growth units, teaming up with Dragoneer and Goldman Sachs. David Trujillo, who led the TPG Growth investment, said while Apple was a formidable competitor, Spotify had the advantage of being an independent provider that could address a bigger part of the mobile market. He said the most natural path for it was to be a standalone public company. Back in Stockholm, Forster – who said he was employee no. 7 or 8 at the music streamer – also feels that "Spotify likes being Spotify", though rules nothing out. "It would be emotionally hard not to be us – but who knows?"